Kicking Horse Coffee Grizzly Claw Review – Kicking Horse’s Grizzly Claw blend is a dark roast coffee lover’s dream. This review features a taste test and my complete step-by-step process for brewing this awesome coffee. Seattle’s Best Coffee Post Alley Level 5 Review – Some might call this blend a “sleeper” because you wouldn’t expect to be so delicious. I’ve never experienced a roast darker than this blend (yet). I’ll be honest… I drink this one daily. 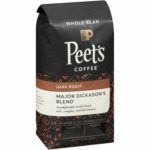 Peet’s Coffee Major Dickason’s Blend Review – This blend has an interesting backstory, but the coffee itself is a delicious dark roast blend. It’s not as intense as Seattle’s best, but it’s a good alternative for sure.